What I had in mind to create was a new inquiry into silkscreening on silk; a direction I wanted to work out by doing. What I had in mind to create was a new inquiry into silkscreening on silk; a direction I wanted to work out by doing. I couldn’t imagine how it could turn out until I actually began to physically work on it — it was just an idea in my head and I wasn’t sure I could really make it happen. Once I arrived at my new home, I realized I was suddenly in the land of not knowing anything about how to make silkscreening happen in France. I did not know where to buy supplies nor how to create the system to work; ie, setting up a new silkscreening studio! What I knew was the French name for silkscreening - sérigraphie - and not much else. As I began trying to track down the supplies I needed (you've certainly guessed that I arrived with NO silkscreening supplies in my suitcase!) I came upon a small sign in front of an exhibition hall in downtown Felletin that announced: “Les Michelines - atelier associatif de serigraphie” (translated "The Michelines - a collective workshop for silkscreening"). What relief! I won’t bother you with the details of how much gumption it took for me to begin asking around to find out where the workshop was located, nor how much more gumption it took to walk to the collective’s headquarters and try to explain to them what my needs were and ask for help (all in French!). What I can tell you, is that after a little talking and explaining and drawing pictures with pencils and hand gestures, it all worked out quite beautifully. 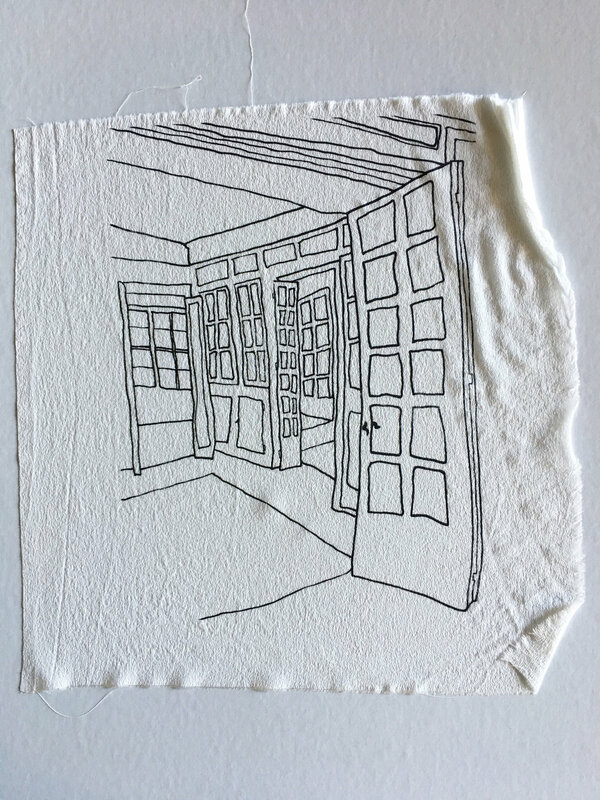 We made a date to spend the day together printing on paper and printing on silk, and it was a day spent in camaraderie with a fellow artist, and one who could teach me the finer points on creating art via the silkscreening process. Here are some images from that lovely day. I want to thank Melanie Leduc and Les Michelines with a thousand “Merci’s” for being there, for being a kindred spirit, and for understanding this artist’s needs with our shared language - art.